So, I was extremely reluctant to watch the first season of this show. MTV has a horrible track record for TV shows. I dove into Scream thinking that I was going to be punishing myself for something horrible I had done and forgotten about. A funny thing happened, though. I don’t regret watching this. It was a lot of the teen drama that you would expect to find in a show on MTV about (*gasp*) teens, but the death scenes really made up for all that high school crap that you have to deal with between brutal murders. If you have seen the Scream movies, then you understand the premise. For those of you who haven’t, let me enlighten you. Scream is about a killer who is treating his murders like a horror movie. In the movie, they go over a set of rules that is supposed to help the teens stay alive. Of course, they don’t listen and end up dying anyway. In the show, the rules are much more toned down. There are a few references to them, but not nearly to the scale of the movie. The show becomes more about unraveling the mystery behind why the murders are happening and less about surviving a horror movie. This didn’t hurt the show for me at all. 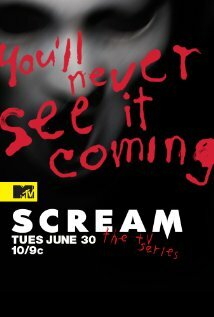 I didn’t expect the show to be exactly like Scream, which isn’t even in my Top 50 of favorite horror movies. It did it’s own thing as much as it could and I enjoyed the twists throughout. I didn’t even have a good notion of who the killer was until the last two episodes. I had suspects and when they finally revealed the killer, I was disappointed that I didn’t see it sooner. The show was good. It’s not awesome, but it’s good. The season finally left a good amount of closure, but opened so many questions for me. I hope it gets a second season, if only to get my questions answered. There was a good amount of cheese and the teen drama got a little thick for me at times, but I can’t expect more from a teen drama on MTV. The script wasn’t bad and the acting was mostly decent (I even recognized two actors). I even enjoyed their ‘tribute’ to the Scream ensemble with the white mask and black hood. If you’re bored and not completely against a teen drama where nearly everyone gets brutally murdered, then you should give it a stab. Tim from Last Week Reviews: Criminal Macabre – A Cal McDonald Mystery #1!